This means that their value decreases as time goes on. Depending on how much the car is worth at the time of purchase, the depreciation could change dramatically over the amount of time you own it. A down payment is an amount of money that is invested in paying off the total amount the car is worth. From this point, where does the rest of the money come from? Since the buyer does not always have the complete amount on hand to pay for the car fully, they will ask the bank to loan them the money. These loans that are given from the bank must be paid off in a certain amount of time that is determined when the loan is created. With these loans comes interest rates, which pretty much is a percentage that gives the rate that the amount will grow by. An interest rate is the annualized cost of credit or debt capital computed as the percentage ratio of interest to the principal. 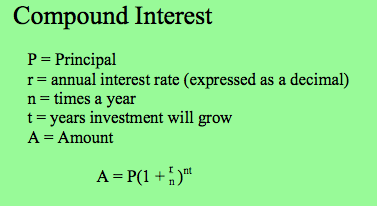 Since loans and other money accounts have these interest rates, they gain or lose money based on what they are. A way to calculate this loss or gain is by using the Compound Interest Formula.